Aquaponics in Domes? No! No! No! Aquaponics in Cold Climates Works Well! If you decide to send us an angry note telling us we’re wrong, please attach YOUR photograph of a green, lush, thriving aquaponics system within a dome and we’ll post it on our website along with your information. Several times a week we receive inquiries from potential customers asking us if our Portable Farms Aquaponics Systems can be placed within a geodesic dome. We take a deep breath and shatter their dreams by saying, “No. Portable Farms are designed to be placed within a rectangular building. We’ve never seen our farms work successfully within a geodesic dome, but if you can do it, please send us pictures and we’ll tell the world.” Then, they wipe a tear from their eyes and we never hear from them again. WHY do we not recommend installing aquaponics systems within domes? The domes do not provide enough air flow and the food rots before it matures. 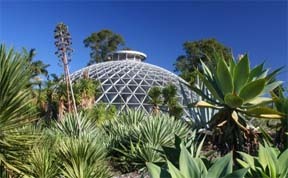 The domes receive too much sunlight and the intensity of the rays of sun burn the plants. 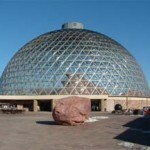 It is very difficult to both evenly heat and cool the interior of the dome to grow healthy food year round. 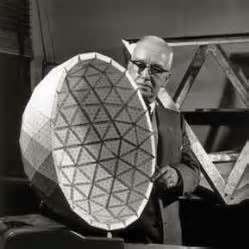 Buckminster Fuller – 1895-1983, a 20th Century inventor, gifted the world the geodesic dome and all of its amazing attributes. A geodesic dome is a domed structure that is shaped like a half a ball and is created by equally sized triangles that are evenly spaced. Air stratification and moisture distribution within a dome are unusual, and these conditions tend to quickly degrade wooden framing or interior paneling. Privacy is difficult to guarantee because a dome is difficult to partition satisfactorily. The interior space functions as a single space and sound travels and is amplified as it moves to the outside edge and then along the interior skin, so sound is all over. This makes every noise everywhere noticeable and annoying. It is nearly impossible to get away from any sound inside a dome. Unless, you break up the interior with solid linear walls. Smells, and even reflected light tend to be conveyed through the entire structure. Restricted use due to lack of headroom. Design for basic furniture did not fit within a circular plan. To heat a dome is an interesting exercise in fluid mechanics and heat transfer. Window coverings are not enough, there needs to be a fan to circulate the hot air down to the floor running most of the time when the dome is closed up. To sum up domes. They really look neat and they were/are futuristic. Domes are fantastic for enclosing space. They are not fun to live in because the sound and smell is all over the place and the heat all goes to the top and you have to find some way to push it down to the floor. However, there must be a new ‘dome-wind blowing’ because we are receiving at least three to five requests per week on, ‘How large of a PFAS Module can I put into this size dome? If you are an incredibly adept carpenter and can make a curved grow table that is level in all directions, you may want to build a 3 ft wide tray around the outside edge of the dome or make a nice rectangular tray that take up the middle of the entire floor space. If not, please consider a rectangular building to house your farm, they are much easier to build, easier to heat and an easier space to install an aquaponics system. Portable Farms’ suggestion is to build a rectangular building that will house a grow tray Module of sufficient size to feed your family. This shape has many advantages over a dome. It will be cheaper, easier to build, easier to control the interior environment and far easier to plant and harvest the bounty produced by your aquaponics system. Your Company makes “a” system that is not conducive to be adapted to a dome. While many other Companies make systems for domes. So do you want photos of those systems or just if somebody tried to install your system in a dome ? 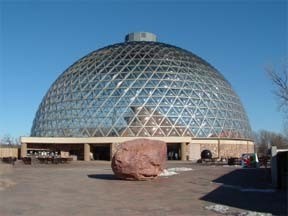 Many people have adapted aquaponics to domes. It is not our system specifically that is an odd fit for domes, it the lack of flat surfaces. Putting a rectangle inside a dome takes up a large amount of floor space. I love domes and we are building one next summer, but the extra work involved in making Grow Tables that curve or take up most of the space does not make sense to us. Because we do not recommend domes to house our systems, no we do not want photos of current systems that are not PDAS technology. Thanks.